A classically beautiful mailbox can add sophistication to your home’s exterior. However, any mailbox is vulnerable to destruction without a sturdy mailbox post. 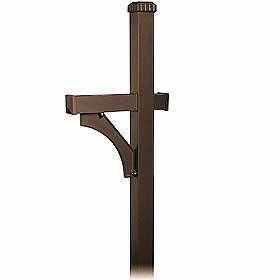 Most mailbox posts can be purchased already constructed. They are often made of composite material or of wood. Composite posts are made of material that is nearly indestructible. It will not rust, warp or split. There is also no risk of termites with composite mailbox posts. Another popular option is the steel or metal mailbox post. These posts are very durable. However, they can easily rust and often require yearly painting. While many people buy already constructed posts, other people choose to make their own mailbox posts with wooden posts. To install a mailbox post, you should dig a hole (approximately six inches deep). After the hole is created, you must fill it partially with wet, mixed concrete. While the concrete mix is still wet, the mailbox post should be inserted down into the hole and held until the concrete sets. Whether you decide to go with a pre-constructed composite post or decide to create your own using lumber, you should find a mailbox post that is sturdy. This is especially true if you live in a rural area. Those homes located on busy streets or within the curve of a road should take extra caution in choosing their post, due to possible car accidents. Overall, the sturdiness of the post will determine how much damage your actual mailbox gets, should an accident of any kind occur.